HONG KONG — Cathay Pacific Airways reached a preliminary agreement on Wednesday to buy 9.9 percent of Air China, a step that airline experts said signaled the opening of the Chinese aviation market to international competition and a move by Chinese carriers into global markets. The alliance, outlined in a memorandum of understanding, ties two of Asia's more successful airlines, which have profited handsomely from China's extraordinary economic growth over the last quarter-century. Cathay will buy the stake at Air China's initial public offering, which will be held here late this year or early next year. The short-term effects on air travelers in and through Hong Kong and mainland China, however, are less clear. Cathay Pacific and Air China said in a joint statement that they planned to coordinate their marketing and sales for routes they both currently serve- a step that could reduce competition and make lower fares less likely. Kapil Kaul, a senior vice president in New Delhi for the Center for Asia Pacific Aviation, a consulting group based in Sydney, Australia, said that Wednesday's deal would clear the way for similar foreign investment in China's other two major carriers, the China Eastern Airlines Company and the China Southern Airlines Company. Investments in either carrier are more likely to come from other Asian carriers than from European or American carriers, as Chinese authorities in Beijing are more likely to weigh such deals in geopolitical terms than in financial terms, Mr. Kaul said. The Swire Group of Britain controls Cathay Pacific, but the airline has its hub in Hong Kong. While the carrier used to promote itself here as a British airline, especially before Britain returned Hong Kong to China in 1997, it increasingly portrays itself these days as a Hong Kong company. Kong Dong, the vice chairman of Air China, said his company made the pact with Cathay because "we believe that there are many areas of our operations where we can cooperate together and leverage our respective strengths for the future prosperity of both companies." Air China has already applied for permission to issue H Shares on the Hong Kong Stock Exchange; the two companies gave no hint on Wednesday of how these shares, including the 9.9 percent stake for Cathay, would be valued. Air China dominates air travel in and out of Beijing and the rest of northeastern China, while China Eastern is strong in Shanghai and east-central China and China Southern dominates Guangzhou and the rest of southeastern China. 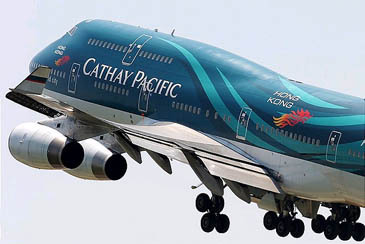 Cathay Pacific is the dominant carrier in Hong Kong and also flies to Beijing. It received approval this week to increase its flights to Beijing, according to Bloomberg News. Peter Harbison, the managing director of the Center for Asia Pacific Aviation, said on Tuesday that Beijing appeared close to giving permission for four Chinese budget airlines to begin operations. The arrival of such airlines could force Air China and Cathay Pacific to cut costs, and is part of a general move by Beijing to begin liberalizing air traffic in and out of China. If the budget carriers begin international flights, they could even put pressure on American carriers like United and Northwest that are now expanding service to China. Wednesday's link with Air China further tangles Cathay Pacific's already complicated relationships on the mainland. Cathay Pacific and the China National Aviation Corporation, the state-owned parent of the Chinese carriers, each own large stakes in a third carrier, Dragonair. Dragonair is one of the most active carriers on routes from Hong Kong to mainland cities. Air China and Cathay Pacific did not address in their statement how their alliance would affect Dragonair or the level of competition in Hong Kong, which has Asia's biggest airport in terms of international passenger departures and arrivals. Dragonair began sharing flight codes with China Southern on Dec. 1 last year. And the Swire Group unit that controls Cathay, Swire Pacific, started a joint venture last year with China Eastern to manage airports. Sandra Lee, Hong Kong's permanent secretary for economic development, announced a new air services agreement last month between Hong Kong and mainland China that somewhat expands Cathay's access to mainland markets. But the agreement did not expand the access of airlines based outside of Hong Kong or the mainland, a decision criticized by executives at FedEx Express, which would like to operate more cargo flights through Hong Kong.